Grouping a trio of unexpected kitchen containers is a simple way to transform common flowers into an eye catching accent. Here we used a red colander, white roasting pan and a blue ice bucket. All simple things most of us have around the home. 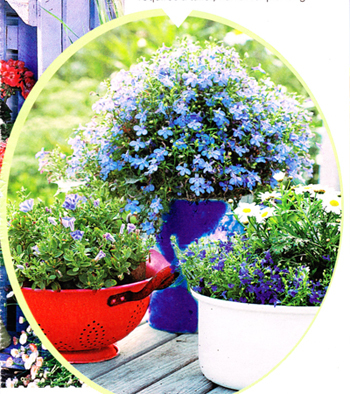 Each one is holding petunias, lobelias and daisies, inexpensive plants available at most nursery and landscape centers. For the most balanced display, match the proportions of the blooms to the size and shape of the pot! A domed container like the colander looks best with a rounded mound of flowers, whereas a cylindrical container like the ice bucket requires a taller, narrower planting! A ladder display is best for a small area! 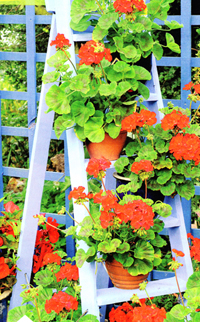 Stepladders are great for displaying potted plants & flowers because they take up mostly vertical space. You could place one on a deck or balcony without feeling crowded. To prevent hiding too much of the A-frame try staggering the potted plants right to left, leaving the top two steps bare and choosing smaller, upright plants like geraniums shown. And for a small scale display, skipping white ensures harmony. In a tighter space, the stark contrast of white can be overwhelming. Read more..... Cure insomnia with potted plants. Read more..... The lore & legends of gazing balls.